Before we know it, the holiday season will be right around the corner and if you have little children, you know what that means… toys! One of the best toys you can get your children (and one of the toys they will love the most!) are ride-on toys. These “miniature vehicles” give your children the fun and the freedom of driving around the yard and the house at their own speed and at the safety of your precaution. Ride-on toys make fantastic gifts for all children. With many different options available on the market, some of which are a little expensive, we decided to take a look at the 10 best kids ride-on toys below $150. The Power Wheels Lil’ Quad is available in a variety of options including the Fisher-Price Lil’ Quad, the Batman Lil’ Quad, the Kawasaki Lil’ Quad, the Disney Princess Lil’ Quad, and the Nickelodeon Dora & Friends Lil’ Quad among other unique models. This makes it great to find the perfect option for your children that will best fit their interests and what they are passionate about! 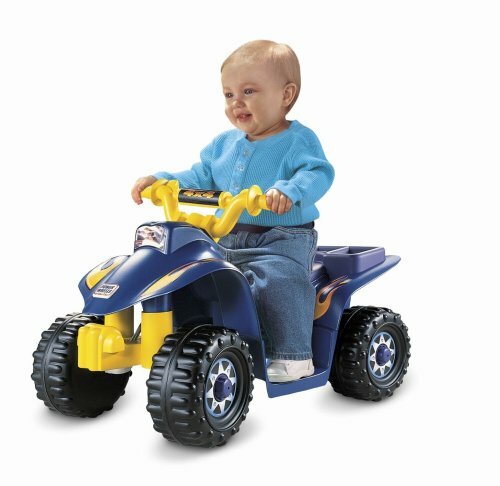 This model of the ride-on toy features sports ATV styling and is designed specifically for toddlers in mind. Including an easy push-button operation for simple stop and go movement, the Lil’ Quad rides low to the ground to help keep your child safe and secure at all time. 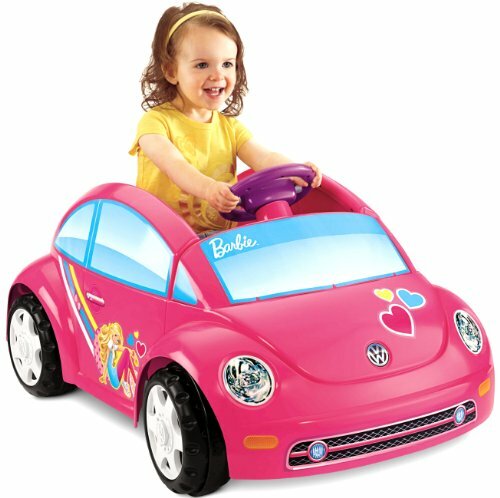 The Fisher-Price Power Wheels Barbie Volkswagen Beetle Toy Car is a perfect option for the child who loves all things Barbie. This beautiful hot pink toy car is characteristic of modern, realistic Volkswagen cars with its impressive design. Barbie stickers also compliment the car’s design to make your children smile at all time. This toy car includes a power lock brake system, furthering the safety and protection of your children as they are playing. The driver’s side door is able to both open and close securely, so your child will feel as if they are actually driving a real-life car! Does your child love Frozen and is she Elsa’s biggest fan? If so, they will love the Kid Trax Frozen 6V Toddler Quad Ride On! This ride-on toy is the perfect mobile for any child who adores Frozen as the vehicle is completely decked out in Frozen goodness! With blue and purple decorations, the toy is sure to bring a smile to your child’s face. This ride-on includes the easy push button drive system located on the handlebars for simple control and movement. Plus, the contoured seat encourages comfortably while maintaining style. For the parents, the front bumper doubles as a carrying handle making the ease of use of this toy profound for everyone! 6v rechargable battery and charger included. 2 mph max top speed. The Disney Junior Minnie Battery Powered Quad Ride On is a fantastic gift option for your child who loves Minnie Mouse! 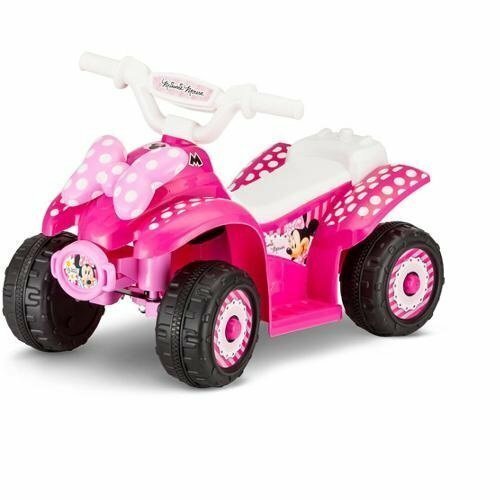 This ride-on toy features hot pink color all throughout including a soft pink and white polka dot bow right on the front, making it very eye-catching. Your child will have the time of their life cruising around the yard with this toy! This model comes fully assembled with a six-volt rechargeable battery. This charger is included as well. Able to reach a maximum speed of two miles per hour, the traction-gathering wheels allow this ride-on to be used on all hard surfaces. Is your child an aspiring medical professional? Kid Trax’s Doc McStuffins 6V Ambulance Ride On gives your child the opportunity to begin caring for the world at a young age! This ride-on comes complete with flashing emergency lights and sirens. It also includes horn sounds so your child can arrive safely to save the day on their imagination’s adventures. This ride-on toy features rubber traction strip tires for a firm grip to the ground. A removable storage bag is also included so your child can bring their other favorite toys and dolls with them on their adventures. 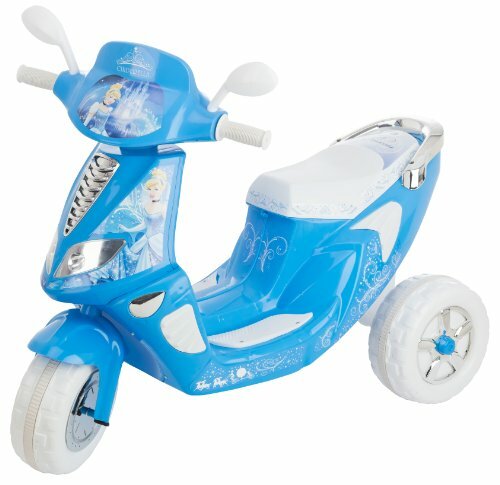 If your child loves Cinderella, then they will be certain to fall in love with the Kid Trax Cinderella 6V Scooter! This ride-on toy is a beautiful sparkling blue, a gorgeous color for the Cinderella fan. An easy to use foot pedal operation is standard along with light-up headlights and flashers so your child can take their adventures into the night with your guidance and permission. Also, this ride-on three-wheel scooter has horn sounds, melody music, and rubber traction strip tires, making the experience of riding this toy one straight from a fairy tale. The Kid Trax 6V Camo Quad Ride On is the sport’s lovers dream. 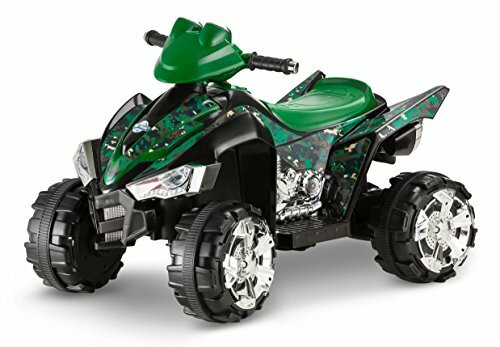 This sleek green, black, and silver ride-on toy will have your children jumping for joy. If your children love to play outdoors and want to take their ride-on toys to adventures in nature, then this is the perfect toy for them to do so. With forward and reverse speeds, the Kid Trax 6V Camo Quad Ride On features Kid Trax Power Trax Rubber Traction Strip Tires to keep the vehicle moving even in tough terrain. Real working headlights and Kid Trax’s Direct Connect one-step charging system with six-volt direct connect charging are standard included as well. For the adventurous type, this is the best option! 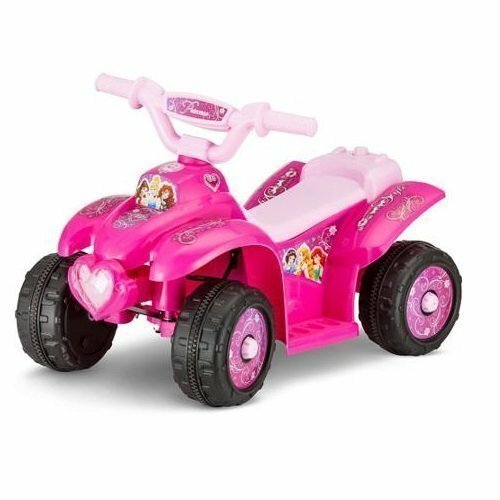 The Disney Princess 6V Electric Quad, Pink by Kid Trax will make the princess lover the happiest child in the world. If your child dreams of being a princess, their dreams will come true with this ride-on toy! Featuring handlebar push button throttle control, your children will be able to drive themselves as simply as possible. This is perfect for little hands as they will be able to control the toy without any issue. Designed for toddlers, the low contoured seat gives easy access to young ones. Plus, the maximum speed of 1.5 miles per hour will help you as a parent stay calm in knowing your child will be safe having the time of their lives. Recommended for children 18-36 months; maximum user weight 40 lbs. Is your child ready to explore the outdoors? 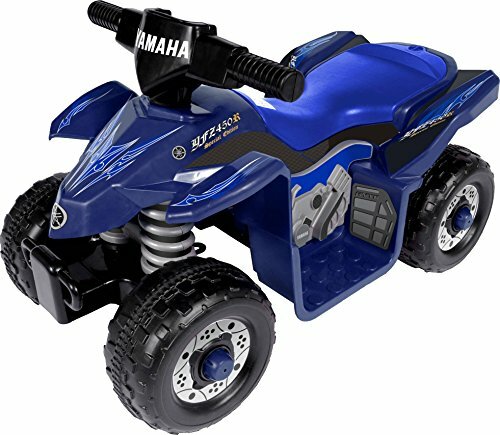 If so, the Yamaha Kids YFZ450R ATV 6-Volt Battery-Powered Ride-On Quad will be the ideal ride-on choice for them. Available in both sporty red and blue colors, this ride-on has a cool styling design that is based on the authentic Yamaha YFZ450R ATV making your child feel as if they are riding around the local racetrack! This toy is built for both indoor and outdoor use, so no matter where your children want to take their adventures, they can do so with this model. It is recommended for children ages three to five and includes a six-volt electric motor with a full four hours of use per single charge. 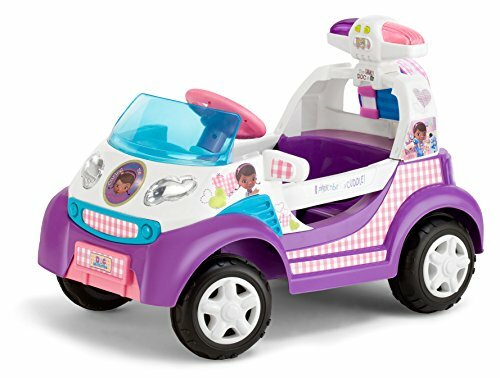 The Power Wheels Ride on Car for Kids Sports Racing Style is the sporty child’s dream! This ride-on toy resembles the modern racing motorcycle. 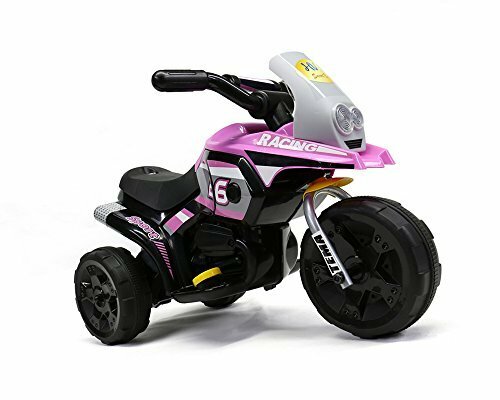 Suitable for children aged two to four years old, this toy three-wheel motorcycle is able to travel up to speeds of 2-3 km/h. The realistic design of the toy includes a right foot level where the child steps down to drive and releases to stop. When driving, a fun engine sound is given and the front LED lights to shine to let you know your child is having a great time! This holiday season, your children will have the time of their lives with ride-on toys! 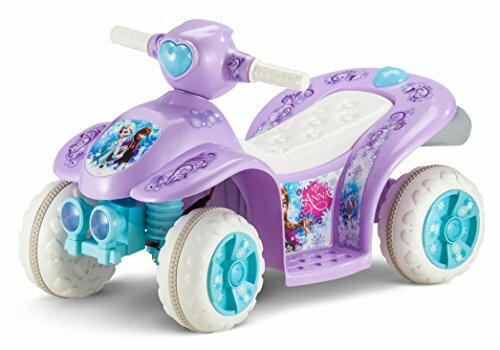 With ride-on toys available in all types, including those relating to princesses and monster trucks, you will find the best gift options for your children. Bring them the greatest happiness with their new ride-on toy!